As always, Matt, in what you wrote, I find much with which I agree (albeit not without qualification), some from which I dissent, and nothing that is not thoughtful and thought provoking. In this instance, my main bone of contention is with your characterization of a Catholic understanding of authority rooted in a supposition that the Holy Spirit speaks exclusively or even primarily through the hierarchy. That is to ignore the many truths conveyed through the centuries in the words and deeds of a litany of saints, scholars and artists, both great and humble. We do not suppose that Truth is the private preserve of either bishops or popes. God is the Truth and the Way and the Life, pouring Himself out to His people through Sacrament and Scripture. Through art, literature, music, architecture, theology and a myriad other paths, the Catholic Church echoes with the sound of its members investigating the nature of beauty, exploring and uncovering hidden aspects of Truth. The purpose of the hierarchy is not to act as exclusive spokesmen for the Holy Spirit, nor to jealously guard their authority and prerogatives, but to confirm the people in the truths thus uncovered, and preserve them from snares and pitfalls along the way. Democracy describes a collective search for truth, amid the shadows and uncertainties of human fallibility. It is an approach that is respectful of human equality and dignity, wisdom and folly; it most appropriate to contexts of doubt and subjectivity. Truth, however, being singular and objective, is not democratic at all, it is fundamentally authoritarian – the source of all authority, in fact! Authority bears temptations to arrogance and abuse, but democracy is not without its own moral hazard. The peril of excessively democratic habit is an unspoken conceit that, through our will, we determine what is true. Rather than humbly assenting to a transcendent objective Truth, truth becomes contingent upon our assent instead. In the case of the LCWR, this appears to me to have been the problem. Intensely devoted to corporal words of mercy, pouring themselves out in service to the least of His brethren, they began to become, in some measure “of” the world, rather than simply in it. When the LCWR publicly entertained talk of a Catholicism “beyond Jesus,” they weren’t rebelling against the authority of the bishops or of Rome, but succumbing to an incremental subjectivism that rejects the authority of Truth itself, in the person of Christ. That is problematic to say the very least and requires a reproving response from the successor to the apostles commanded to “Feed my sheep.” The appropriate, charitable response to error is not to deny the Truth, or the person who errs, but to correct the error itself. You are correct, of course, in that the Catholic church does not consider the bishops to be the source of Truth. Indeed, for Christians, the Truth is Christ, pouring himself forth, as you say, in and through the Spirit into and through the life of the church. However, the power to determine when something coming forth in the life of the church is of the Truth or not is, as you acknowledge, left with the bishops and the pope. And this really brings me to the essence of my concern for the Roman Church. It seems to me that the Roman system, and the ecclesiology which underlies it, does not account for the fact that a self-perpetuating hierarchy that is both exclusively male and exclusively celibate might be unable to recognize the Truth as it pours forth into the life of the church in new ways. Self-perpetuating hierarchies, especially those that do not include representatives of the breadth of the church’s life, tend to appoint people who have the same way of looking at things, and tend not to promote into its ranks people whose views might be, shall we say, “unusual”, or outside of what the hierarchy considers the norm. And yet, human history both sacred and secular shows us that sometimes it is those who are outside the norm that are able to bring fresh insight and vitality, who are able to see as Truth what others do not see as Truth. Jesus himself was an example of this. It is the dynamic of the prophets, who almost always ran afoul of established religious authority. Certainly, democracies have their own problems in a different direction, as you have pointed out. And so it becomes clear that there is no human system that is perfect. All are subject to error and misperception. As St. Paul said, now we see in a mirror dimly, then we shall see face to face. Human vision is never complete or whole — and that is as true for humans who are bishops as it is for everyone else. Given all of this, I think that the Roman system contains its own risks for misperception of the ways in which the Truth seeks to pour itself forth through the life of the church. The nuns group may, indeed, be going far afield from what would be considered “normative” in the Catholic Church. It is also possible, however, that they are attempting to get ahold of something new that the Spirit is seeking to do in the church, involving language and ideas that are so different from what the hierarchy is accustomed to that they are not able to perceive that the nuns are seeking to bring forth something of the Spirit. In the end, I think the church benefits from as wide a conversation as possible, and I think the Roman system limits that conversation dramatically. Thus, I prefer to be Episcopalian, a church in which bishops are equal partners with clergy and lay representatives in this exercise of discerning what the Spirit is saying. Our system certainly contains its own risks, as well. But it is the risk that makes the most sense to me. I can understand and readily agree with your observation that no human system is perfect, and no human, whether bishop or laymen has full and complete understanding or monopoly on Truth. I would certainly mistrust any human institution claiming to itself a monopoly of authority. But the Church is not simply a human institution, it is not an association of like minded individuals, it is the Mystical Body of Christ (Romans 12:4 – who knew a Papist could quote scripture, eh?…Thank you, Google!). The Church is an expression, an incarnation in the world of God’s providential love for man and enjoys certain guarantees not available to purely human institutions (Matthew 16:18). 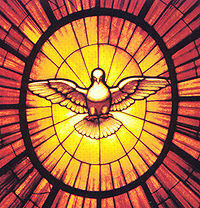 It is both the voice of the Holy Spirit calling out to man and the joyful response of man to that summons. It is the continuation of The Incarnation throughout time and place. Bishops can, do, and have erred many times in the past and will do so in the future, however, in those limited instances when speaking, not as individuals, but authoritatively on behalf of “The Church” the bishops together, or the Pontiff individually enjoys the charism of infallibility. Certainly, the Holy Spirit may be working through the LCWR to bring forth some heretofore under-explored aspect of truth – in fact, I rather suspect that He is. All the more reason for a correction of errors! Authors rarely publish their first drafts, they review, and revise extensively, honing their message, submitting their work to editorial review, subjecting flashes of inspiration to the executive function of reason, much as a jeweler cuts and polishes a stone, that its inherent beauty may be revealed in purity and brilliance. IF the Holy Spirit IS speaking through the LCWR, then the truths with which they are wrestling are the provenance of the whole Church and rightly will involve review and input of theologians and the hierarchy. Finally, let us not exaggerate the exclusivity of the male celibate hierarchy in the process of discerning Truth. Many of the outstanding figures of Catholicism have spoken with the authority of Truth from without the confines of teh hierarchy. In the course of the past 150 years, the most influential saints, St. Therese of Lisieux (The Little Flower), a humble Carmelite nun, and now Doctor of the Church, St. Faustina of the Divine Mercy, and Blessed Mother Theresa of Calcutta have been women; the most influential and joyful apologists for the faith have been G.K. Chesterton, a member of the laity, and Thomas Merton, a Cistercian monk; and Our Lady revealed Herself, not to a prince of the Church, but to three shepherd children at Fatima. In the end,as Chesterton argued, I think that the genius of the “Roman system” is what it ever has been, the reconciling of opposites, not in compromise or a dilution of two extremes into moderation, but in allowing for both the enthusiastic exploration of Truth AND authoritative discernment of Truth from error, in a way that seem missing from the Cantaurian system.. In the end, I prefer to be a Roman Catholic, with all of the adventure it entails. Well, my friend, this is not something on which we will agree! I certainly affirm that the church is both a divine and human institution, but I cannot share your “high view” of the church when its bishops act together authoritatively. But God bless you for your faith in them! If we agreed…well..where would the fun be in THAT!